Encore is our original core buildup material! Kits include: 1 (25g) Base + 1 (25g) Catalyst, 3mL Connexio Part A, 3mL Connexio Part B, 25 20ga NeedleTubes, 10 Micro Applicators, Mixing Pad and 50 Spatulas. Does Encore require the use of a matrix or core form? No. Encore® does not slump and therefore does not require a matrix or core form. Can eugenol materials be used AFTER Encore is used? Yes. Eugenol containing material can be used AFTER Encore is fully cured. Encore cuts similar to dentin and is easily cut with a standard diamond or bur. Remove all decay and old restorative material. Any eugenol present must be rinsed away with ethanol before proceeding. A prefabricated post may be cemented in place using ContactCure™ cement. Apply Onyx™ 40% phosphoric acid etching gel to dentin and enamel surface. Attach needle to syringe and express with a slow, steady pressure. Rinse off after 10 seconds, leaving surface moist but not wet. Place the bonding system of choice into the preparation according to the manufacturer's instructions. 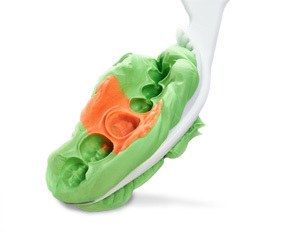 To ensure complete cure of all material in the canal, we recommend using Connexio, a dual-cure 7th-generation adhesive that is a light-activated self-etch system with a dual-cure activator. Do not use self-etching, one-bottle bonding systems. When placing the primer, be sure that all of the solvent has been evaporated and the preparation has a glossy appearance. Before light curing, the bonding agent should be thinned with a light air spray. Using opposite ends of the mixing spatula, dispense equal amounts of Base and Catalyst pastes onto the mixing pad (note: for a longer working time, use a higher percentage of catalyst paste). Mix thoroughly for 10 to 15 seconds, then back-load into the NeedleTube™ syringe tip. Fill the tip no more than 1/2 full. 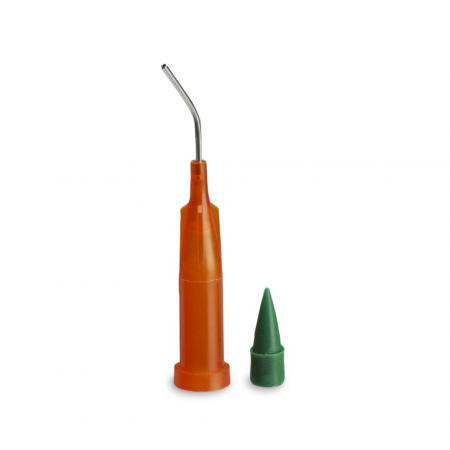 Press filled tip over the green plug to seal it, and insert into a Centrix C-R® syringe gun. Bend needle if required. 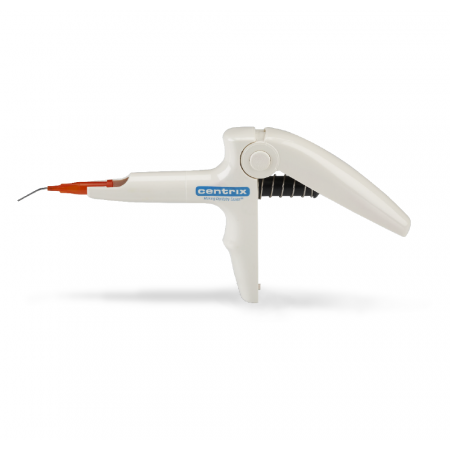 Inject Encore into the post hole and/or prepared area, squeezing the syringe with a slow, steady pressure. Keep the tip imbedded in the material as you inject, to reduce the chance of voids. After material is fully set (typically 4 to 5 minutes after injection), Encore can be cut to the desired shape, using water-cooled diamonds or burs. Storage: All kit components should be stored at room temperature, or within a range of 50F-75F (10C-24C). Refrigeration may be used to extend shelf life. Return to room temperature before use. Onyx etchant: Contains 40% phosphoric acid. Avoid contact with skin, eyes, or mucous membranes. In case of contact, rinse with copious amounts of water. Get medical attention for eyes. Adhere adhesive and dual-cure activator: Contains acetone and alcohol. Highly flammable, keep away from sources of ignition. Close cap tightly onto bottles immediately after use. Do not store or use in presence of eugenol. Encore composite resin — Do not store or use in presence of eugenol. Do not use on persons with known sensitivities to composite resin restoratives.